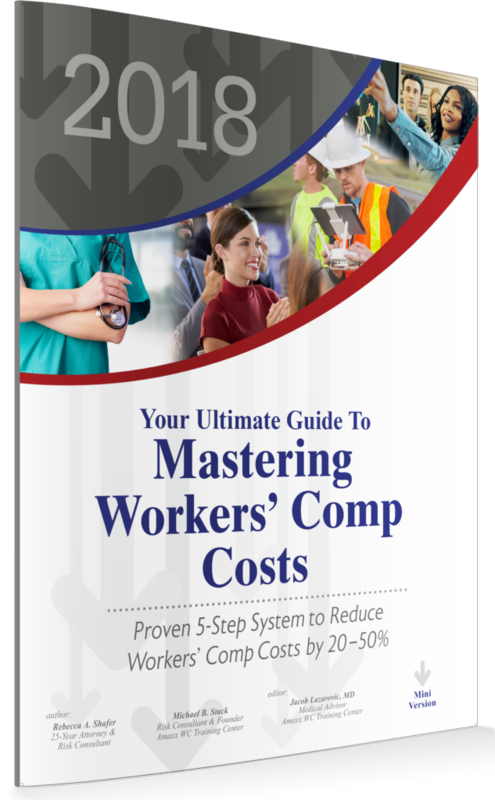 The BIG BOOK (Comprehensive Version) contains everything you need to know to reduce workers’ comp costs and improve safety step-by-step. Our Mini Book summarizes each chapter of the big book and is a great overview of our WC cost-reduction process. The Pocket-Size Mini Book is a great client giveaway that helps your customers and keeps you top-of-mind. More questions that our book answers: Table of Contents. 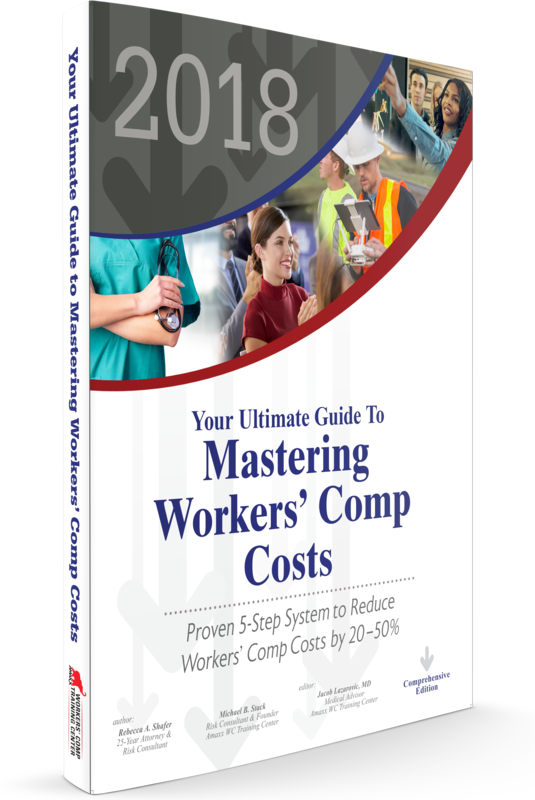 One book that covers how to assess your workers’ compensation program, design the most cost-impacting strategy, roll out comprehensive changes to your organization and monitor and manage the program going forward. 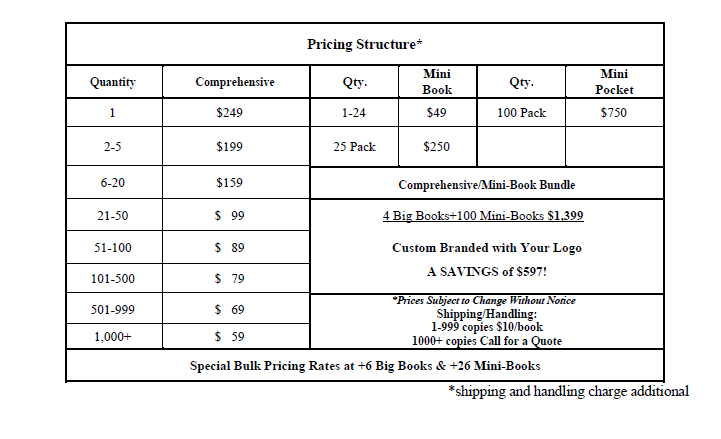 Bulk Pricing Available – when purchasing over 5 copies, custom branding is available at no additional charge. A 20-page booklet summarizes each chapter of the comprehensive book to one page each. These valuable mini-books make great handouts at conventions – they stay forever on the desk of your prospects and clients, like a huge business card! Order a 25 pack for only $10/book and you can custom brand your order with your logo and full back ad at no additional charge. Order a 100-Pack for only $5/book and you can custom brand your order with your logo and full back ad at no additional charge. 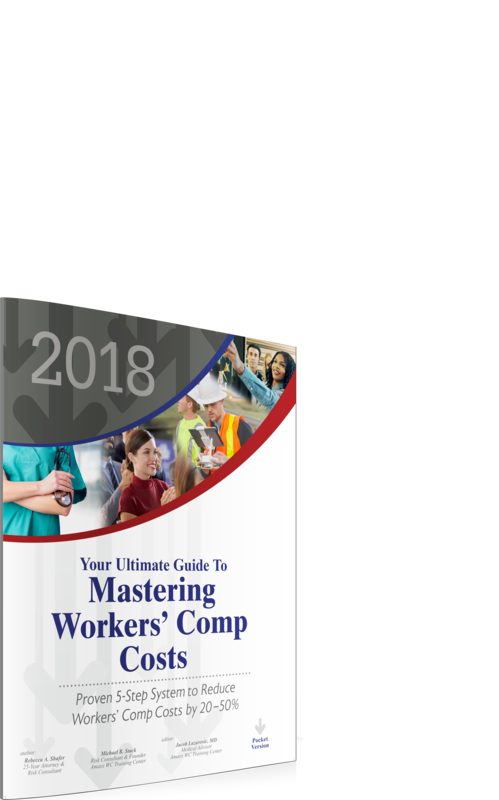 Risk Managers and Safety Directors use this book to train supervisors in workers’ compensation claims management. They learn more about their area of responsibility – post-loss cost containment – adding to their overall knowledge. This book is also used to get management commitment in rolling out a Return-to-Work program, one of the biggest cost savings areas relating to workers’ compensation costs. Brokers, Agents, Insurance Companies, Reinsurers, Adjusters, and Consultants use this book for prospecting and to learn about specific aspects of cost containment; and benefit by passing their knowledge on to their clients. For example, when discussing how to develop a Return-to-Work program and a client asks about “off-site return-to-work programs,” the broker quickly finds that section in the book, reviews it, and passes the answer on to the client, along with a copy of the cost containment book. The book becomes a “lesson plan” tool. Producers and Account Executives give the book to prospects during formal presentations such as annual stewardship meetings to illustrate how their company is on top of workers’ compensation issues. The book also makes a good client gift. Vendors such as doctors, investigation firms, law firms, medical management vendors and triage companies learn how their services might fit into the workers’ compensation marketplace. They learn what is important to employers, and what they look for in medical provider relationships. Many also private-label the book and give it to prospects to show them how the services fit together. Human Resources find it useful in bringing new hires including risk managers, safety professionals and supervisors, up to speed very quickly. Often the HR Director is responsible for some aspect of workers’ compensation or disability leave, and needs to understand more about workers’ compensation cost containment methodology. Printed in USA. Made in America. Contact Michael Stack at 207-281-2599 or mstack@reduceyourworkerscomp.com with any questions.